For on-screen help on each page of the DataPortal click this button. 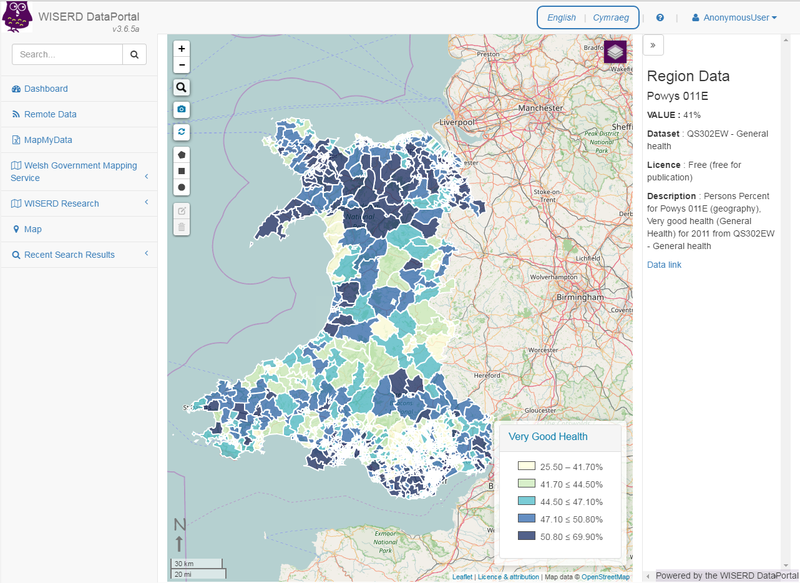 The WISERD DataPortal is a web application that enhances a researchers ability to search, discover, map and download socio-economic research data related to Wales. The aim is to encourage the re-use & repurposing of existing data. 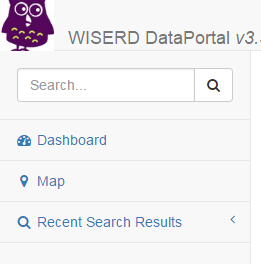 To find out more about the DataPortal project you can click on the WISERD button. 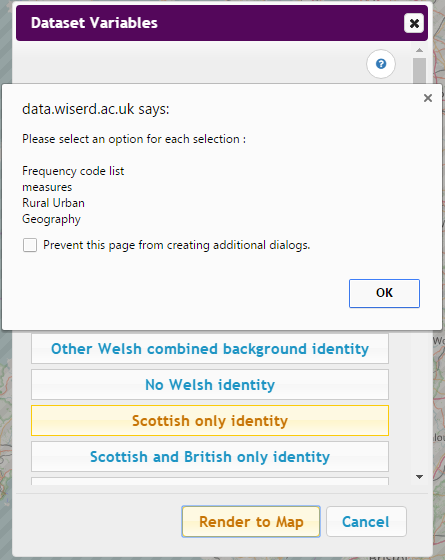 The DataPortal is available in both English and Welsh, to alternate between languages you can use the toggle buttons at the top of the page. You can find these buttons on each page of the DataPortal, which allows you to switch between languages whenever necessary. 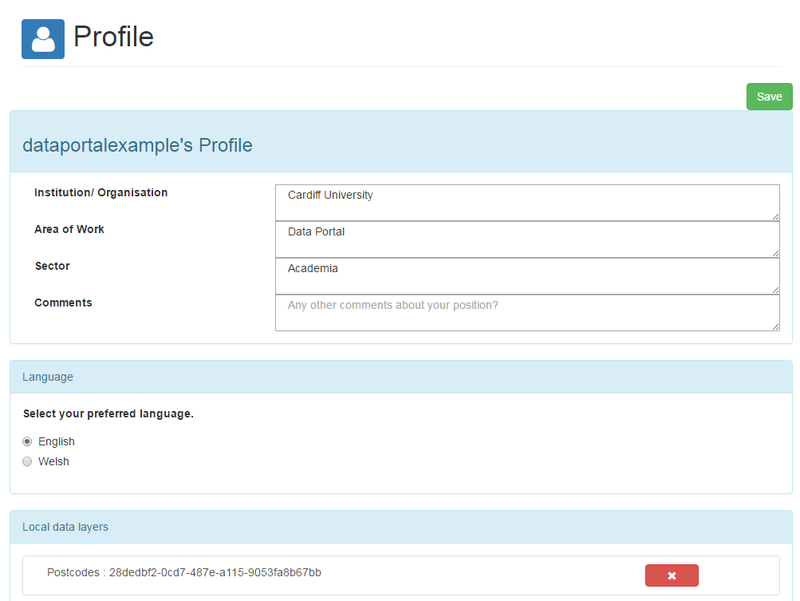 You can also choose a language preference in your profile settings, which will be stored and used each time you log in. To use the full suite of DataPortal functionality you must first create an account using the Login button in the top right hand corner. 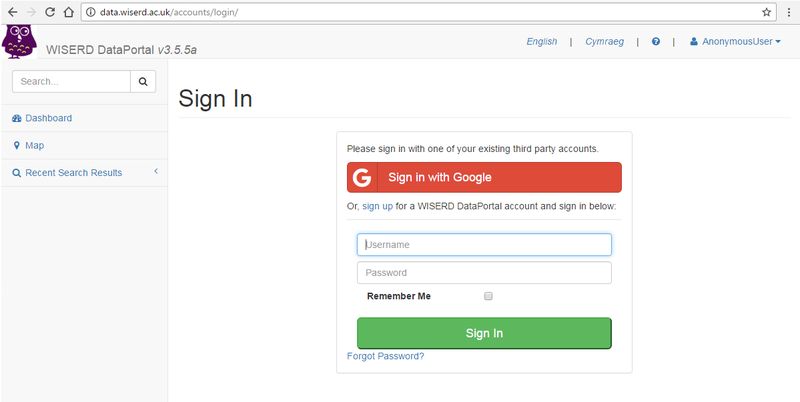 You can either sign in straight away using an existing Google account, or create a new username and password. Signing up to the Dataportal requires you to create a username and password, as well as providing an email address to verify your account. Once logged in you will be directed back to the Dashboard. 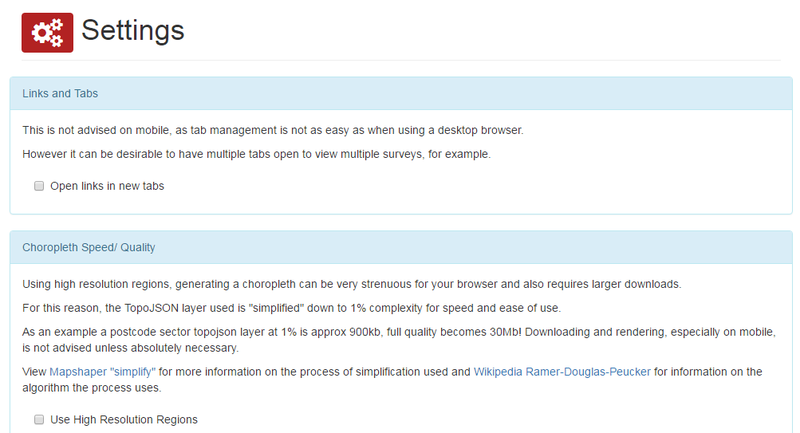 From this page all sections of the DataPortal can be accessed using the buttons shown. 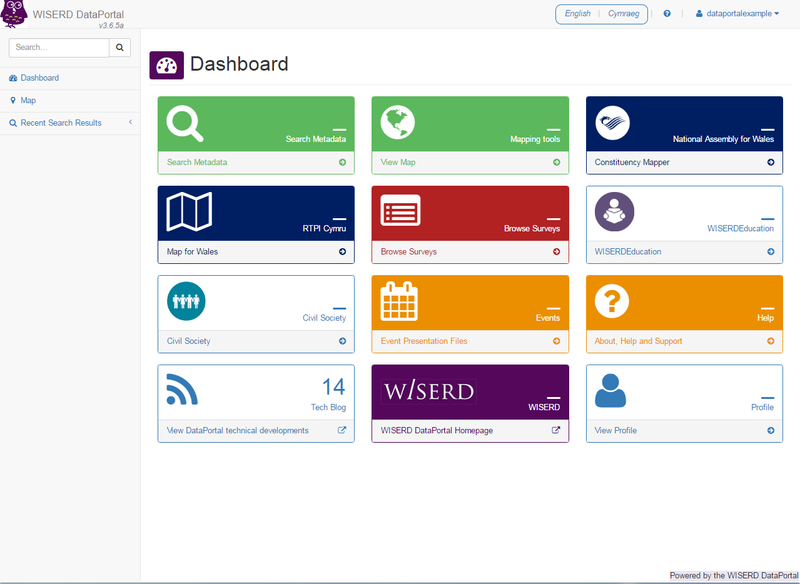 The sidebar contains a dashboard button throughout the DataPortal, however, the logo at the top of the page can also be used to navigate back to the dashboard as well. Your profile contains details about you and your settings, as well as the toggle at the top of each page you can set your language preference here. Your preference will be stored and used each time you log into the DataPortal. Always remember to click Save when you have updated your profile/settings. 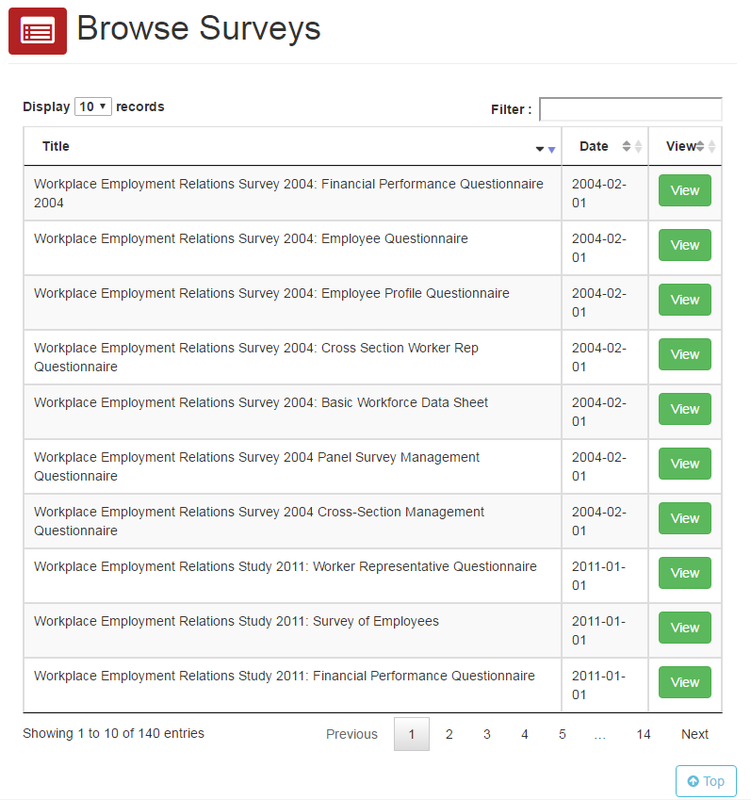 Browse Surveys is an easy to use overview listing all the surveys the DataPortal has to offer. On this page you can filter the surveys and view their content. 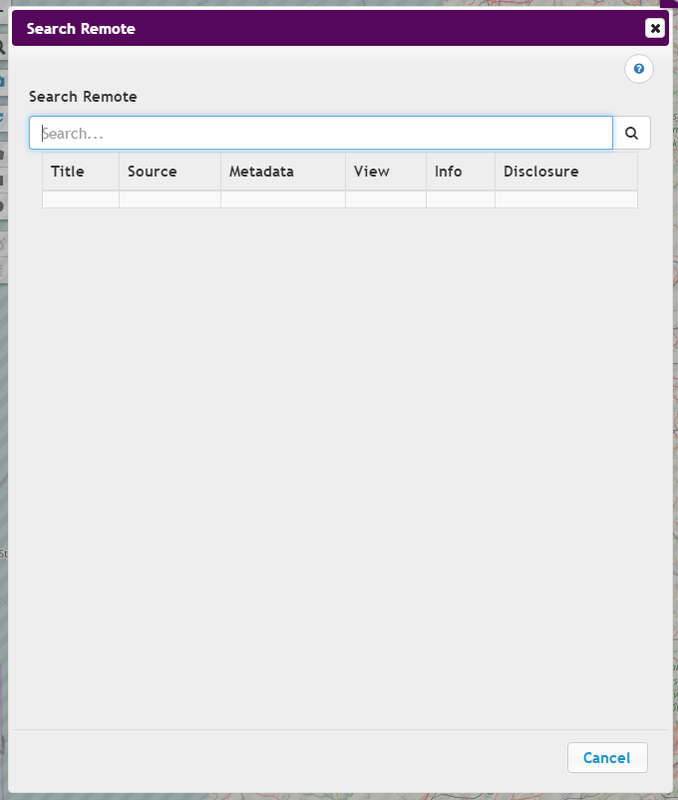 Datasets can be found and searched through the Search Metadata button, or simply by using the search bar on the left hand side of the DataPortal. 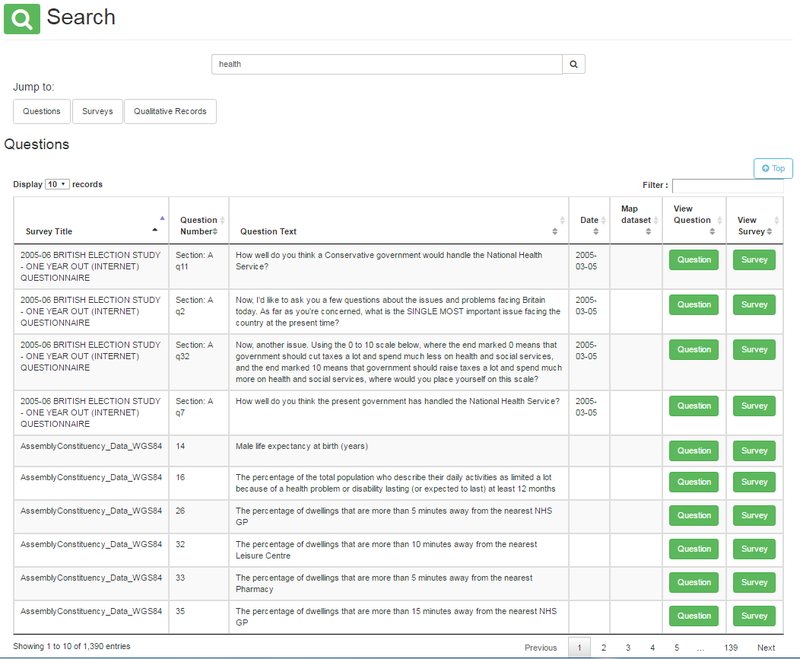 When searching a keyword such as Health, all related questions, surveys and qualitative records will be displayed. 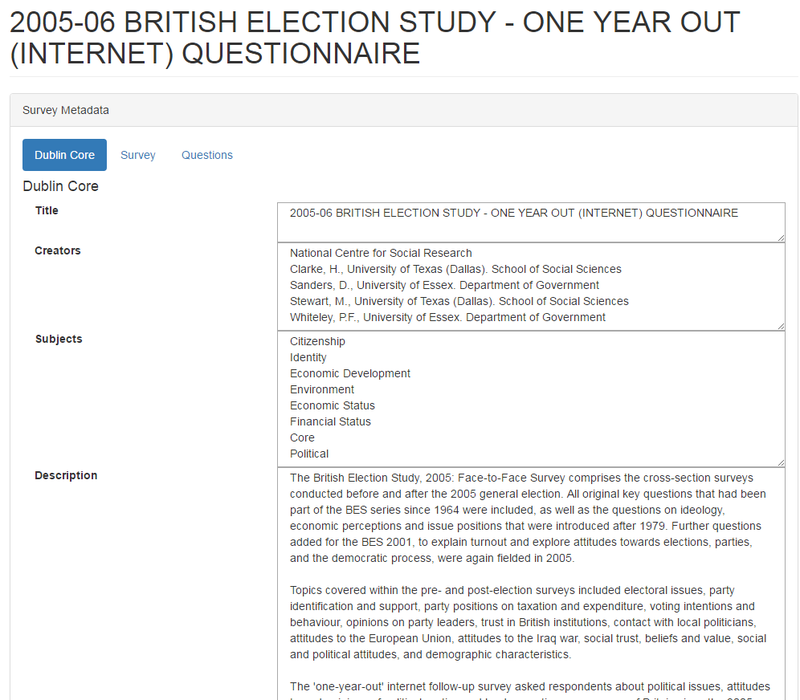 These results appear in a grid format which can be filtered between Questions, Surveys and Qualitative Records. You can also use the search bars at the top of each subsection to search through the results as well as sorting the results by clicking on a column headings (for example sorting by date). Once you've found data of interest to you there are two options, View Question or View Survey. View Question will bring up this page. This page gives you information about the question. 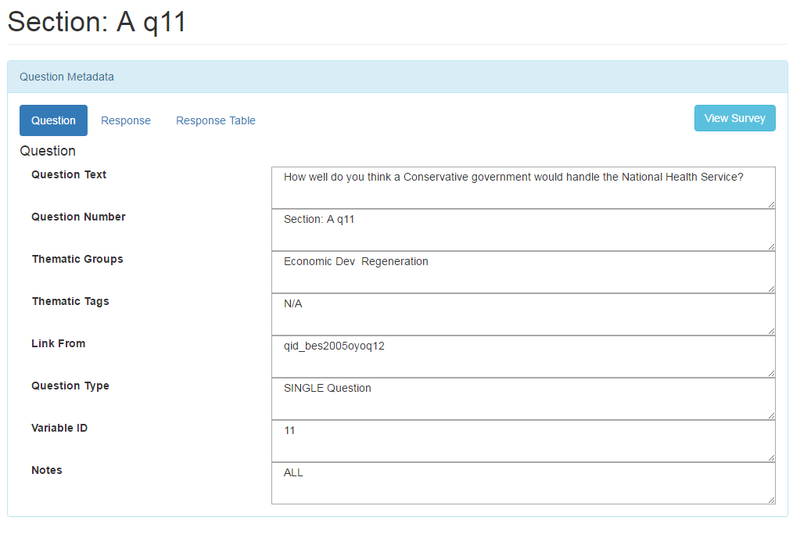 By clicking on the tabs at the top of each page you can see the Response information and the Response table. The Survey button will open the following page. The Dublin Core, this page provides all the metadata about the survey as a whole. They may provide information on who produced the survey, how the survey data was collected, how many people responded and how to obtain the response data. The Source URL will take you to the downloadable data. Two other tabs include the Survey tab - providing information about the survey itself - and the Questions tab - which displays all the questions in the survey. The search page offers 3 different sections of results, by clicking the Survey tab you can search through the survey section, this offer different functions to the questions section. The DataPortal provides a simple way of mapping data you have found quickly and easily by clicking the Map Survey button. Once you have clicked this button it will take you to the map page and ask you to choose some data in order to present the information. For more help on mapping data go to the next section. On clicking the View Map button DataPortal is directed to this page - an interactive mapping section. DataPortal gives the user the ability to plot information on a map, making the data easier to visualise and sort. 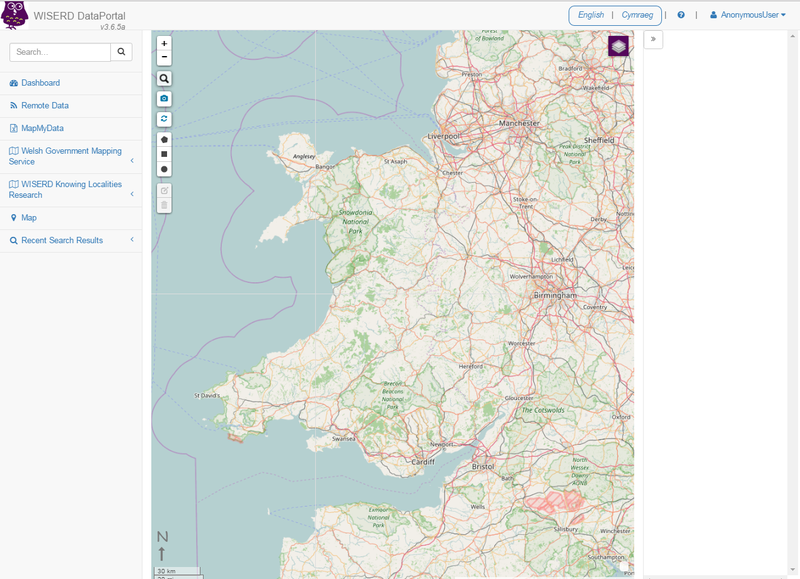 This is the starting page where a user can insert data onto a map to be analysed further. 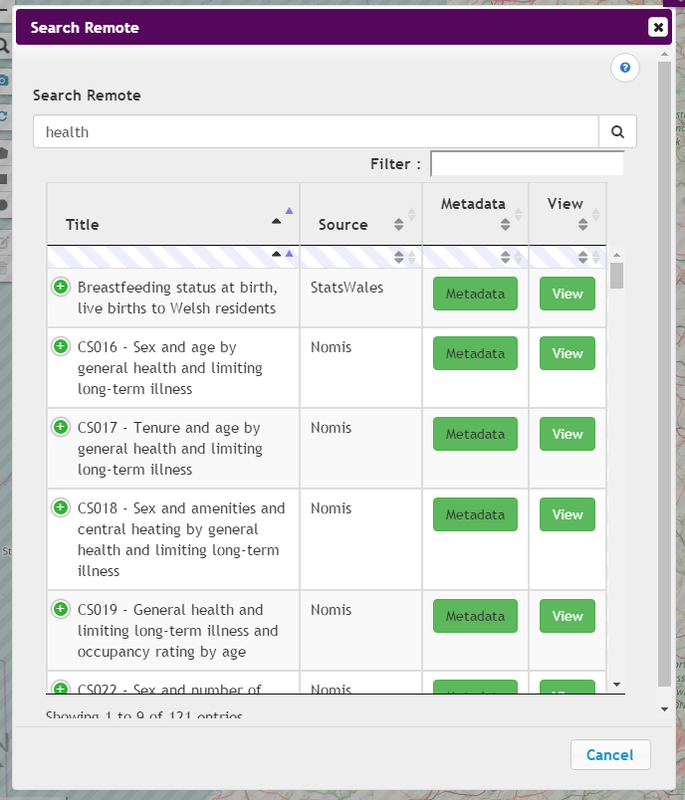 The familiar sidebar contains the dashboard button, options for importing data onto the map using layers, and Recent Search Results which is a quick way of adding previously used data. The layer button (located in the top right hand corner of the map, allows the user to select layers to view or hide. 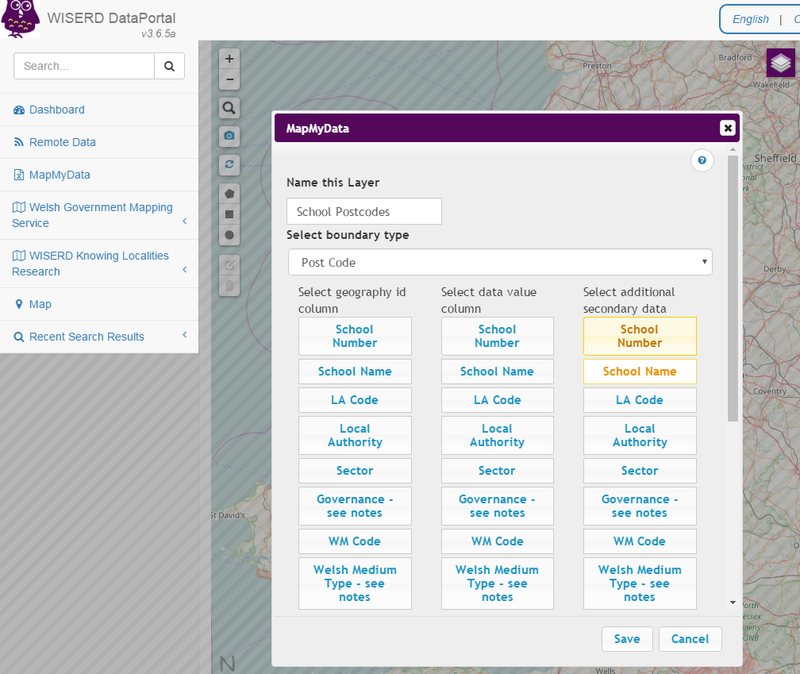 The WISERD DataPortal can be used to find and map a variety of socio-economic data, points of interest and boundary data for Wales. You can then export the map and download the data for further analysis. To add remote data to the map, click Remote Data located on the side bar. The following search box will appear, by typing in a key word different datasets will appear. 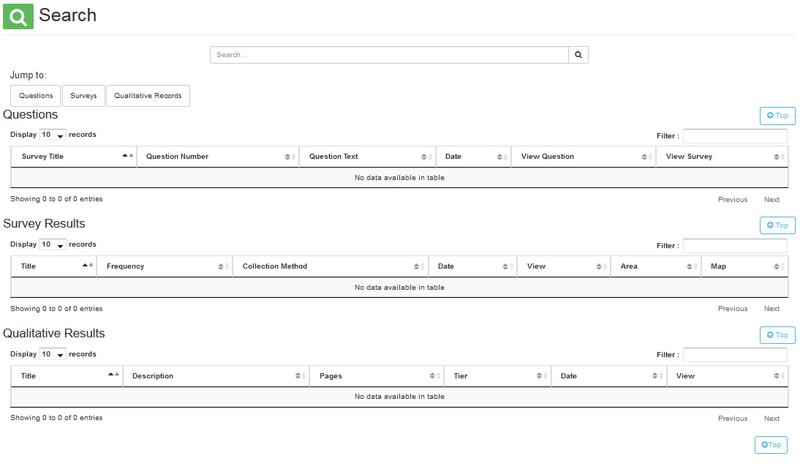 Select any dataset of interest and click View. A list of variables will appear, these help divide the data into meaningful layers, for example, choosing Very Good Health, Annually as a Percent in Total by LSOA. Click Render to Map. One common error that may occur is shown below, if you see this error it means you haven't selected enough variables. The error box will list all the variables that have not been chosen to help you select the correct ones. 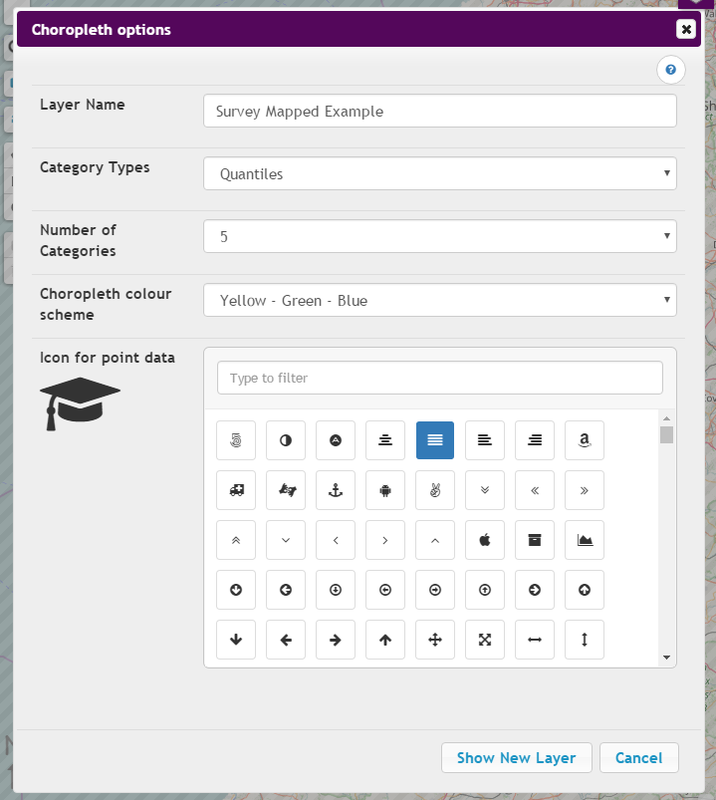 The following box will show Choropleth Options (these are the visual features of the layer) select the desired options and click Show New Layer. The following will be displayed. The key at the bottom of the map shows the different percentages of very good health in different regions.From this map you can select a region and find out information about it in the right-hand sidebar. 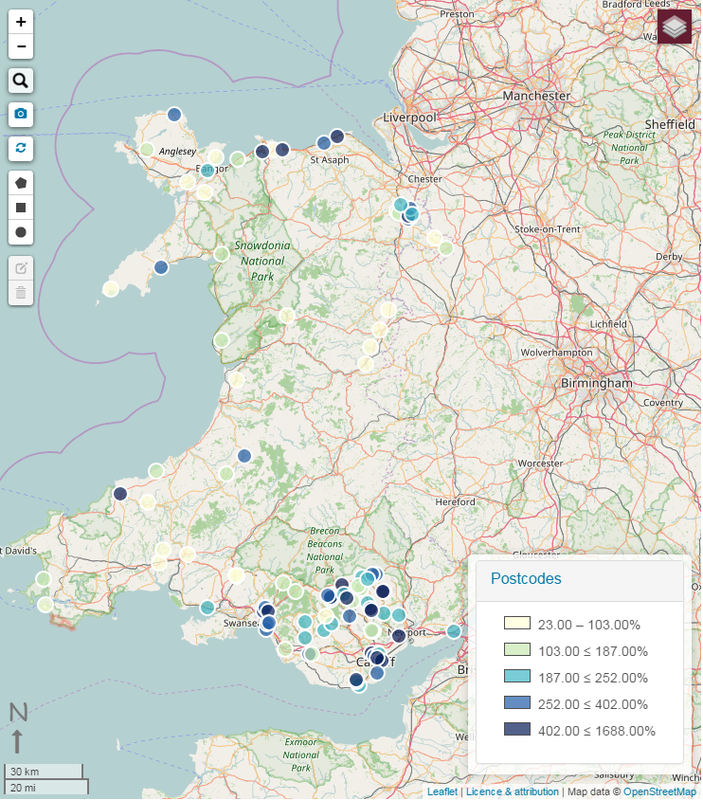 The WISERD DataPortal allows users to map their own data for areas in Wales and to export this as a publishable map. This function has been specially designed so that all the mapping occurs inside the users browser rather than on the WISERD DataPortal server. This means that potentially sensitive data does not leave the users machine. 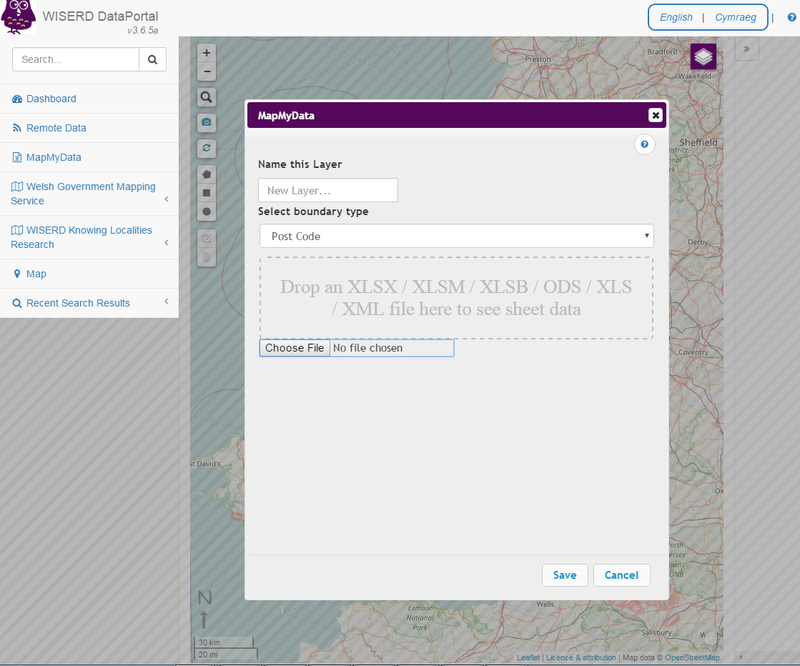 You can import your own data onto the DataPortal by clicking the MapMyData button. A box will appear where you can choose a local file to upload onto the map. The following box will display the fields available to display on the map. You must select the Choropleth options so that your data can be displayed correctly and name the layer. Once Show New Layer is clicked the data will be displayed on the map including a key on the righthand side. This will remain on the map until you choose to delete it. To turn the layer off use the Layer Manager (the brown icon in the top right hand corner of the map). 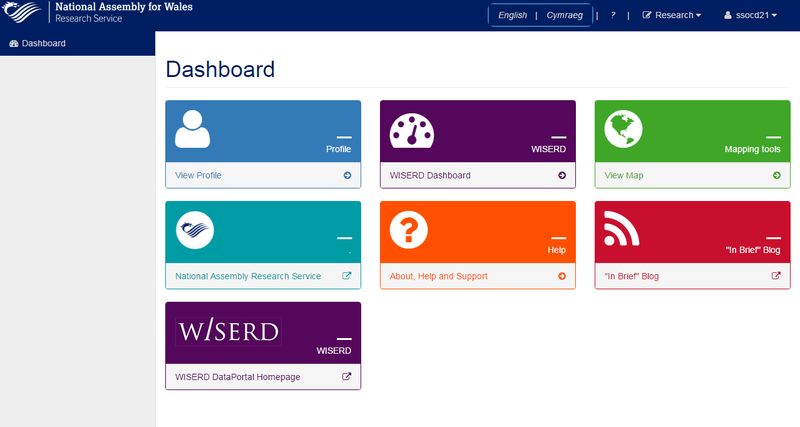 As part of our work with the National Assembly for Wales, a bespoke interface has been developed for the WISERD DataPortal which allows Assembly research staff, Assembly Members and their support staff to access and map a wide range of data for National Assembly for Wales Constituencies and Regions. 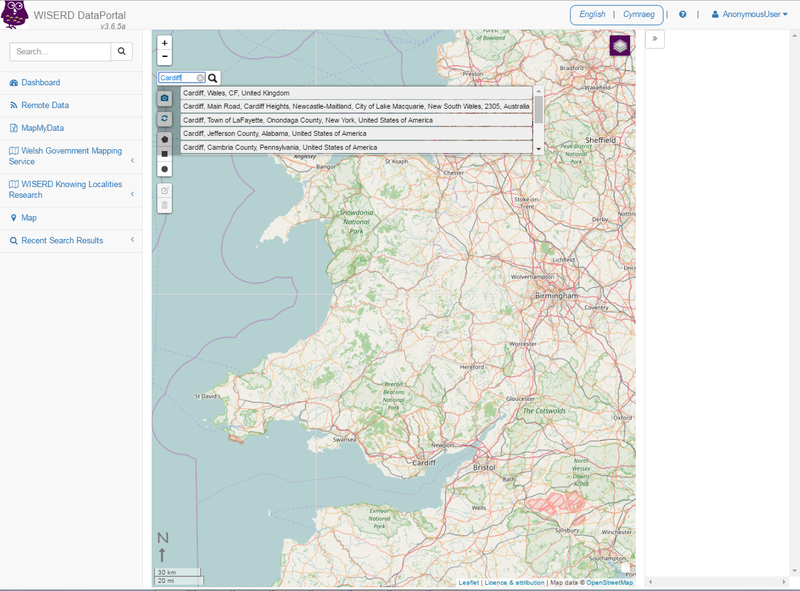 As part of our work with Map for Wales, a bespoke interface has been developed for the WISERD DataPortal.